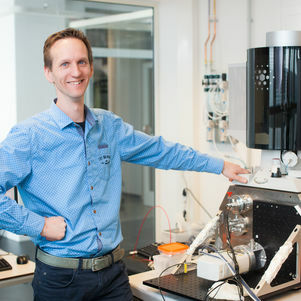 Jacob Hoogenboom (1972) is associate professor at Delft University of Technology since October 2008. He obtained his PhD in September 2002 from Utrecht University for research conducted at the FOM Institute for Atomic and Molecular Physics (AMOLF) in Amsterdam. In the following years, he worked as a postdoctoral researcher at the MESA+ Institute for Nanotechnology at University of Twente and as a research fellow at ICFO - the Institute of Photonic Sciences in Castelldefels (Barcelona) in Spain. In 2008, he spent 8 months at Utrecht University. J. P. Hoogenboom, G. Sanchez-Mosteiro, G. Colas des Francs, D. Heinis, G. Legay, A. Dereux, and N. F. van Hulst, The single-molecule probe: vectorial mapping of photonic mode density in a metal mirror cavity, Nano Letters 9 (3), 1189 (2009). F. D. Stefani, J. P. Hoogenboom, and E. Barkai, Beyond quantum jumps: blinking nanoscale light emitters, Physics Today 62 (2), 34 (2009). J. Hernando, E. M. H. P. van Dijk, J. P. Hoogenboom, J. J. Garcia-Lopez, D. N. Reinhoudt, M. Crego-Calama, M. F. Garcia-Parajo, and N. F. van Hulst, Effect of disorder on ultrafast exciton dynamics probed by single molecule spectroscopy. Physical Review Letters 97, 216403 (2006). J. P. Hoogenboom, E. M. H. P. van Dijk, J. Hernando, N. F. van Hulst, and M. F. Garcia-Parajo, Power-law-distributed dark states are the main pathway for photobleaching of single organic molecules, Physical Review Letters 95 (9), 097401 (2005). J. P. Hoogenboom, A. K. van Langen-Suurling, J. Romijn, and A. van Blaaderen, Hard-sphere crystals with hcp and non-close packed structure grown by colloidal epitaxy, Physical Review Letters 90 (13), 138301 (2003). J. P. Hoogenboom, A. Yethiraj, A. K. van Langen-Suurling, J. Romijn, and A. van Blaaderen, Epitaxial crystal growth of charged colloids, Physical Review Letters 89 (25), 256104 (2002).